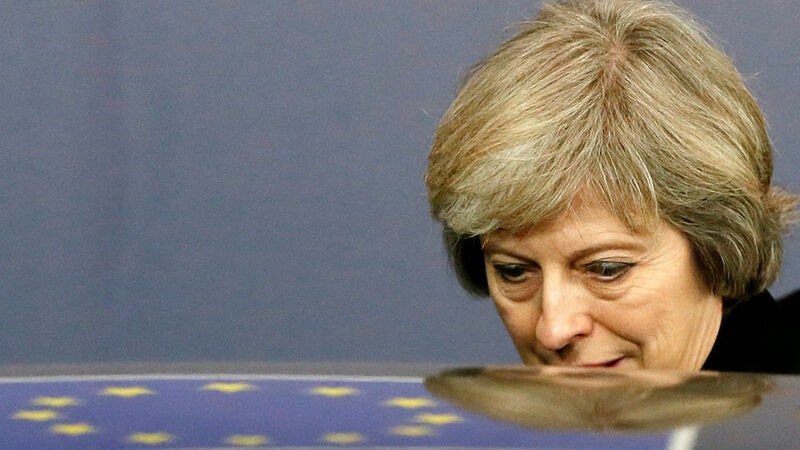 As the British prime minister’s Brexit struggle worsens, she might have spied a possible escape route. A vote in the Swiss parliament on the EU market principle of free movement might serve as a blueprint for the UK’s way forward. There was the usual flurry of diplomatic handshakes and kisses at the European leaders summit in Brussels on Thursday. But at the center of that flurry, one leader looked painfully lost and alone: British Prime Minister Theresa May. She shuffled about, fiddling with her jacket and looking, in vain, for a friendly conversation. Unfortunately for May, that moment was caught on video and quickly went viral. May’s nervous and confused behavior reflected not only the UK’s isolated place in Europe, but also the degree to which she and her government appear overwhelmed. It’s now clear that the EU will not accept any situation in which the United Kingdom has access to the European single market without freedom of movement for EU citizens. May has all but promised the British public she will deliver both of these things. She now knows this is impossible. This month the news for May has gone from bad to worse. Her attempt to reach an early deal with German Chancellor Angela Merkel for the “right to remain” of Brits in Europe and Europeans in Britain was curtly rebuffed. Then, it emerged that the UK’s top diplomat in Brussels has warned the government that a Brexit deal will likely not be finalized until the middle of the next decade. But the UK will have to leave the EU within two years after triggering Article 50, and May has said that will happen before the end of March next year. So that means some kind of transitional arrangement will be needed. “We might well get to a point where we can symbolically leave but all sorts of details will still remain to be sorted out,” former cabinet secretary Gus O’Donnell told the BBC this week. It sounds a lot like the “decade of uncertainty” former Prime Minister David Cameron warned about during the referendum campaign. The British government appears to be in an increasingly precarious situation, with few good options left. But as the UK supreme court deliberates over whether to give the British Parliament a say over Brexit, a vote taken by the Swiss parliament in Bern on Friday might serve as an interesting example if May is looking for an escape route. Like Norway and Iceland, Switzerland is a sort of “pseudo-EU” state. Because the Swiss public rejected joining the EU in a 1992 referendum, the government found a way to make Switzerland part of the EU in all but name. They negotiated a package of bilateral accords with Brussels. The agreements give Switzerland access to the single market, but in return, the Swiss have to follow the vast majority of EU law – without a vote in creating those laws. One of those – indeed one of the four principles of the single market – is freedom of movement: All EU citizens must have the same right to work in Switzerland as a Swiss citizen. In 2014, the Swiss public narrowly voted in a citizen-initiated referendum to set limits on the number of people who can come to Switzerland from certain EU countries. This handed a huge problem to the Swiss government. If they implemented the public’s wish, it would invalidate the accords with the EU, and Switzerland would be kicked out of the single market. Brussels and Bern have been engaged in torturous negotiations over the past two years trying to find a solution. On Friday, the Swiss parliament partially climbed down. MPs approved a law that dodged the referendum’s call to set quotas and instead gives locals first crack at jobs in times of high unemployment. Will the 50.3 percent of Swiss people who voted for the restrictions agree? This is the crucial question, and one that the British government may be closely watching. If the Swiss are willing to accept a fudge on the immigration issue, perhaps the British who voted “leave” will follow suit. Perhaps, a parliamentary act that appears to implement the spirit of the referendum vote rather than its letter is palatable to the anti-EU voters. But even if this were the case, it’s unclear whether the EU will accept the compromise. EU leaders are aware of the precedent it sets for the UK if they accept. If both sides sanction the compromise, it could be the first good news for May in a long while. But the reaction to Friday’s vote will likely not be clear for several months – by which point it will be time for May to pull the trigger on the dreaded Article 50.